If you always get a thrill when that glittery ball drops on New Year’s Eve – but you have no intention of heading to Times Square – join us for the mountain version of that memorable occasion. On Thursday, December 31, 2015, quiet little Brasstown, North Carolina (several miles from Murphy, NC) will host its 22nd Annual New Year’s Eve Possum Drop. This nationally famous event kicks off around 9:30 p.m., when several hundred to thousand hardy revelers gather at the Clay’s Corner station, right next to the John C. Campbell Folk School. This family-friendly evening is alcohol free, so bring the kids to enjoy it, too! The festivities begin with toe-tapping bluegrass from the Barker Brothers, followed by Larry Witcher’s classic “Eulogy to a Possum” that always stirs the crowd’s emotions. Shortly after 10 p.m., the Guest of Honor arrives with considerable fanfare. As the lucky possum reclines in comfort, he enjoys a gospel music tribute and the much-anticipated Possum Idol Sing-Off. Next, the Miss Possum Contest takes center stage. If you’re expecting a typical beauty pageant, where lovely young ladies glide across the stage in gorgeous evening gowns, you’re barking up the wrong tree. Instead, you’ll see several lumberjack types who likely drove their pickup trucks to the event – except they’re all decked out in frills and glitter. Believe it or not, they’re all competing for the coveted “Miss Possum” crown. This event defies description – you just have to see it in person. After the whoops and hollers die down, enjoy a “Tribute to Our Service Men and Women,” quite appropriate for this highly patriotic region. As midnight approaches, excitement builds for the big Possum Drop. 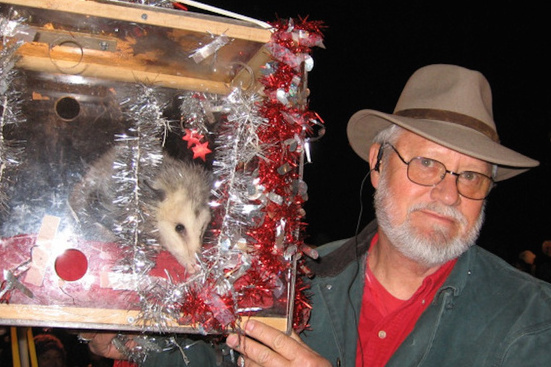 This year, station owner Clay Logan plans to lower a live opossum, who views all the hoopla from his cozy decorated Plexiglas box. In contrast, Logan was compelled to use a fake possum during the 2014 event, after an animal rights group’s legal action blocked him from using a live animal. However, this year the North Carolina General Assembly passed legislation that brought a real possum back into the picture. The animal rights group challenged the new law, but a North Carolina Superior Court Judge ruled in the possum’s favor. Now, you might be wondering about the possum’s pre-event accommodations. Because this sluggish marsupial is the main attraction, Clay Logan ensures that his newfound friend gets the star treatment for several days before the show. Mr. Possum gets a nice comfy bed and tasty meals, and he doesn’t have to worry about becoming a Murphy, NC area traffic statistic. In other words, the possum lives high on the hog. And just in case you wonder, we support the use of the opossum! It gets the red carpet treatment making it the luckiest possum possible. Finally, the clock strikes the midnight hour, and Clay Logan happily lowers his possum to welcome the New Year. The crowd erupts into roars and applause, and there are lots of hugs and kisses to go around. Brilliant fireworks fill the Brasstown, NC sky, and another Possum Drop goes into the record books. Shopping at a non-profit thrift store is like embarking on a gigantic treasure hunt. You might find furniture, household items, clothes, toys, a new dog bed, or a secondhand working computer. You could even snag a piece of vintage glassware or an entire set of china. With terrific prices, and the knowledge that your purchase helps further the non-profit group’s mission, that’s a “win win” for everybody. Best of all, Murphy, NC features several tempting thrift stores within a stone’s throw of each other. Stores are generally open Monday through Saturday, but specific hours may vary. First, check out the Friendship House ReSeller Thrift Store on Highway 64 heading into Murphy. This nicely stocked shop features lots of household items and clothing, and pick-up service is available. All store proceeds benefit the Friendship House, the region’s only year-round emergency homeless shelter for men, women, and children. Next, visit the Valley River Humane Society Thrift Store, also on Highway 64 just past the ReSeller Thrift Store. This value-packed shop is overflowing with good clothing and household item bargains, and new merchandise is always coming in the door. The Thrift Shop funds an amazing 40% of the Humane Society’s work, enabling the organization to reduce Cherokee County’s homeless animal population and actively promote spay/neuter activities. After a tasty lunch in downtown Murphy, head to Christian Love Ministries’ Thrift Store on Alternate Highway 64 (Old 64) in Peachtree. 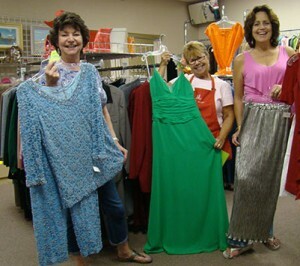 This worthy group operates two thrift shops, selling a good selection of donated items along with handcrafted woodwork. Store proceeds support this Christian-based residential addiction treatment center’s operations. In Murphy since 1996, the Center uses biblical teachings to help residents understand addiction and progress toward recovery. After stashing your bargains in the car, continue on Alternate 64 toward Murphy, and turn right at the Highway 64 Bypass stoplight. Make an immediate left onto Highway 64 West, and travel past the fast food outlets. Turn into the REACH of Cherokee County Thrift Store parking lot. This spacious store is literally bursting with quality clothing, furniture, housewares, and collectibles – all just looking for a new home. Donation pick-up service is available for large items. All Thrift Store proceeds fund REACH’s vital programs, offering support to domestic violence and sexual assault victims and their children. Several miles further on Highway 64 West, visit the Logan’s Run Rescue Thrift Store, conveniently located in the Lakeside Plaza. The shop offers an expansive collection of gently used clothing, along with china, dishware and glassware, home furnishings, and artwork. You’ll even find an enticing book section filled with diverse books and magazines. Donation pickup service is available. The store’s proceeds enable Logan’s Run Rescue to continue its successful Low-Cost Spay/Neuter Program; along with the humane care, rescue, and transport of needy animals. After your productive thrift store shopping trip, consider rummaging through your own closets for donation-worthy items. After all, our Murphy, NC non-profit thrift stores can use your support, and other eager shoppers are just waiting to buy them. ‘Tis the holiday shopping season, and it’s immensely satisfying to find those special gifts right here in Murphy, NC. Take advantage of two special shopping events in early December, and visit our downtown stores right up until Christmas. Bring along a shopping buddy, and fortify yourselves with a tasty lunch. The Daily Grind, Shoebooties, and the Red Brick Deli come highly recommended and are all on the top of my favorites list. Begin your Christmas shopping adventure on Saturday December 5, when downtown Murphy will overflow with holiday cheer. 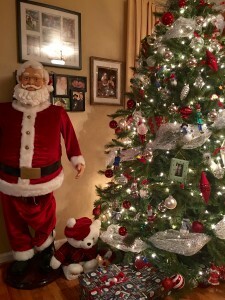 While we don’t have large shopping malls and the typical Christmas shops, we certainly have unique gifts that’ll be the favorite. The town’s outdoor decorations, along with merchants’ colorful storefronts, will get you in a festive mood for finding that perfect gift. Jolly old Santa Claus might also make an appearance, visiting with shoppers as he finalizes his gift list. Inside the shops, enjoy special holiday pricing and other purchase incentives. Chances are, you’ll find some memorable presents while supporting local merchants. On Sunday December 6 from 10-5, visit the John C. Campbell Folk School‘s annual Fireside Sale. The School’s Brasstown campus is just a stone’s throw from Murphy, and you’ll find plenty of parking near Keith House and Davidson Hall. Inside both roomy venues, you’ll see countless fine crafts from regional artisans. If you’re looking for basketry, forged iron, handwovens, jewelry, pottery, or wood, you’ll find them all – plus much more. You can even pick up some handcrafted Christmas ornaments that you won’t see anywhere else. Of course, Murphy’s tempting specialty shops can satisfy giftees with particular tastes. For a nicely rounded collection of books, children’s toys and activity kits, and regional keepsakes, visit the Curiosity Shop Bookstore on Valley River Avenue. On the same block, Blue Moon Elise carries lots of enticing natural body care products that make highly desirable gifts. Style-conscious ladies will be thrilled with fashion and accessory goodies from Sassy’s, or a dazzling piece of jewelry from Paula’s Pawn and Jewelry. Right next door, keep that special guy happy with some fishing gear, hunting equipment, or stocking stuffers from H&H Sports. Or, maybe he’d appreciate a Murphy’s Chophouse gift certificate, great for a tasty steak dinner. Maybe you’d like to enjoy one, too. Just around the corner on Tennessee Street, you’ll find Blue Ridge Olive Oil Company’s delicious olive oils and flavored balsamic vinegars, ideal for the gourmet cook in your life. It’s a unique find that is unlike any we’ve seen elsewhere! If you’re looking for more fishing gear, check out Appalachian Outfitters. You’ll find a great selection of hand-tied flies and fun supplies. Finally, satisfy your favorite seamstress or quilter with a gift from Bless My Stitches Quilt Shop. Just a short car ride away on Hill Street, this highly addictive store offers a huge collection of fabrics, patterns, and accessories. Basically, it’s a quilter’s candy store. Best of all, you can visit this store and other Murphy, NC shops all year ’round – and find a special gift for yourself. And if you want to buy the ultimate Christmas gift, buy yourself or that significant someone a piece of real estate right here in Murphy NC! There’s nothing better and you can start shopping using our online MLS search tool or contact us to let us do the work for you. We’d love to have you as a neighbor! If you take every opportunity to indulge your canoeing passion, we invite you to visit our paddlers’ paradise. With eight sizable lakes just a short hop from Murphy, NC, you can splash your boat in different waters every day of the week. With the proper clothing and safety gear, you can go canoeing no matter the time of year! Believe it or not, you can start your canoeing adventure right in downtown Murphy. First, stop at Appalachian Outfitters on Tennessee Street, where you’ll find PFDs and other safety gear, plus helpful area maps and local knowledge. The North Carolina Wildlife Resources Commission website also provides tons of useful boating information (including launch ramp locations). Next, explore the Valley and Hiwassee Rivers via the Murphy River Walk Canoe Trails, featuring convenient parking and several put-ins around town. What will you see on your Murphy canoe trip? Well, during the summer months, Hiwassee Lake is filled to the gills with water, which spills into these rivers and backs up into the inlets and marshes. Enjoy life in the slow lane as you drift along, spying birds, fish, and probably a few small mammals that aren’t visible from the nearby walking trails. If your canoe naturally gravitates toward lakes, plan a trip to nearby Hiwassee Lake, offering over 160 miles of shoreline in its 22-mile length. Much-smaller Apalachia Lake is just a stone’s throw away, and it’s secluded and absolutely beautiful. To reach either lake, put in at the Hanging Dog Recreation Area boat ramp; or launch your canoe below the Hiwassee Dam or Apalachia Dam. If you’ve gotten the itch to explore more of our regional lakes, you’re in luck: they’re all within an hour’s drive. To the north, you’ll find massive Fontana Lake, with over 230 miles of shoreline and the most impressive dam you’ll ever see. Neighboring Santeetlah Lake offers enticing coves and stunning high-elevation mountains as a backdrop. Nantahala Lake is also worth a visit, as you can ogle the high-dollar lakefront houses while you paddle along the wooded shoreline. Next, head south to Chatuge Lake, spread equally between North Carolina and Georgia. With 130 miles of shoreline, you’ll find lots of quiet creeks where you can stop for a snack. Finally, explore Georgia’s Blue Ridge Lake and Nottely Lake, just a half-hour’s drive from Murphy, NC. Although all these lakes attract seasonal pleasure boaters, there’s plenty of room for everyone. If our super-gorgeous scenery has you maxing out your camera’s memory card, you’ve definitely got mountain fever. I know we do! 🙂 Whether you’re vacationing in Murphy, NC, or you already live here (or want to move here), you’re always looking for ways to capture a piece of paradise. Fortunately, our downtown Murphy NC art galleries have you covered, as they’re full of knock-your-socks-off artwork just waiting to spice up your home or serve as terrific gifts. Even better, the galleries are just a stone’s throw away from each other, making it easy to browse them all. First, let’s visit the Valley River Arts Guild Artists’ Gallery and Store, located at 33 Valley River Avenue. Besides sponsoring the Murphy Art Walks, these super-talented local artisans bring our mountains to life with their amazing artwork. Inside this inviting gallery, you’ll find photography and watercolors that literally jump off the page. You’ll be equally tempted by the wire jewelry, woodturnings, fiber arts, and fine furniture accent pieces. Don’t miss the doll exhibit – each lifelike character has their own distinctive personality, and you’ll find at least one you just can’t live without. Next, hop across the hall to the Highlander Gallery, home to a huge selection of gallery-quality giclee prints. But wait – there’s much more! Check out the striking sculpture, leather, glass art, marquetry, basketry, and felted pieces. The colorful paintings and photographs showcase some of our favorite mountain landscapes. Look for the “old man of the woods” walking sticks, wood-turned cowboy hats, and fragrant handmade soaps that will be a welcome addition to your powder room. Just across the street, you’ll find Gallery 26, a family-owned gallery that also displays talented local guest artists’ work. Located at 26 Valley River Avenue, this shop features a show-stopping collection of wooden artwork. Besides beautiful Southern Appalachian domestic woods, you’ll find exotic hardwoods from Asia, Africa, and Central and South America. Before creating a piece, the artist examines each wood’s grain patterns, colors, and textures – and chooses a species that will make that finished work shine. You’ll also enjoy the finely crafted jewelry and wall art. The pocket mirrors, buttons, and magnets make nice keepsakes for family and friends. Next, head around the corner to the Artists Common Gallery at 81 Tennessee Street. This oldie-but-goodie Murphy, NC gallery has been around since 1996, and is a one-stop shop for art lovers. Besides featuring numerous local artists’ work, the gallery hosts artist Betsy Henn Bailey, who teaches classes in several media. For the icing on the cake, you can get your favorite photographs, paintings, or keepsakes framed here. That’s right – Artists Common includes a full framing shop. Last but certainly not least, drive a few short miles to Brasstown, and visit the John C. Campbell Folk School Craft Shop. 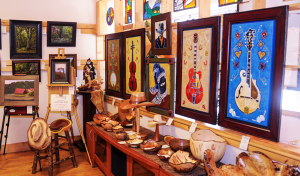 You could literally spend all afternoon here, browsing through traditional and contemporary Appalachian crafts from over 300 juried craftspeople. You’ll find turned-wood bowls, forged fireplace poker sets, marquetry earrings, colorful scarves and table linens, and the list goes on. It’s the perfect place to find a special gift – or a gift for yourself. And naturally, if you find yourself searching for real estate in Murphy NC, we’re here to help you find your home in the mountains! That way, you can enjoy these and all the great things to do in wonderful Murphy! If you’re a golf fanatic who can’t shake that uncontrollable urge to hit the greens, prepare to indulge your passion during your upcoming trip to Murphy, NC. In fact, with five courses within 20 miles, you’ll need a calendar to keep track of the tee times. So throw your golf gear in the car, set the GPS and cruise control, and get ready to swing and putt yourself silly. First, book yourself a cozy mountain rental cabin in Murphy NC, available from the helpful folks at Mountain Country Cabin Rentals if you’re not in or from the area. When you arrive, get a good night’s sleep and enjoy a hearty breakfast at Blue Mountain Grill in Peachtree. Next, work off those tasty pancakes on the 18-hole Cherokee Hills Course at the Cherokee Hills Country Club, less than five miles from downtown Murphy. With rolling hills and mountains for scenery, you’re bound to knock out a good score. For your next golf outing, choose the 18-hole Chatuge Shores Course at the Chatuge Shores Golf Course in nearby Hayesville, North Carolina. You’ll enjoy the scenic 15-mile drive from Murphy to Hayesville, and the forest backdrop beckons golfers all year ’round. If you like a good challenge, the course’s changing elevations will put you through your paces. If you prefer golf games with an upscale twist, head to Young Harris, Georgia for 18 holes at the Brasstown Valley Resort Golf Course. Just 15 miles from Murphy, this property has been ranked as one of the top Georgia courses. You’ll wind through ponds, streams, and wildlife preserves while you try not to be distracted by the gorgeous mountain scenery. Best of all, the course is part of the Brasstown Valley Resort and Spa. What does that mean? Well, you can cap your round with a trip to the resort’s spa or a mouth-watering dinner at the fine-dining restaurant or less-formal Brassies Grill. 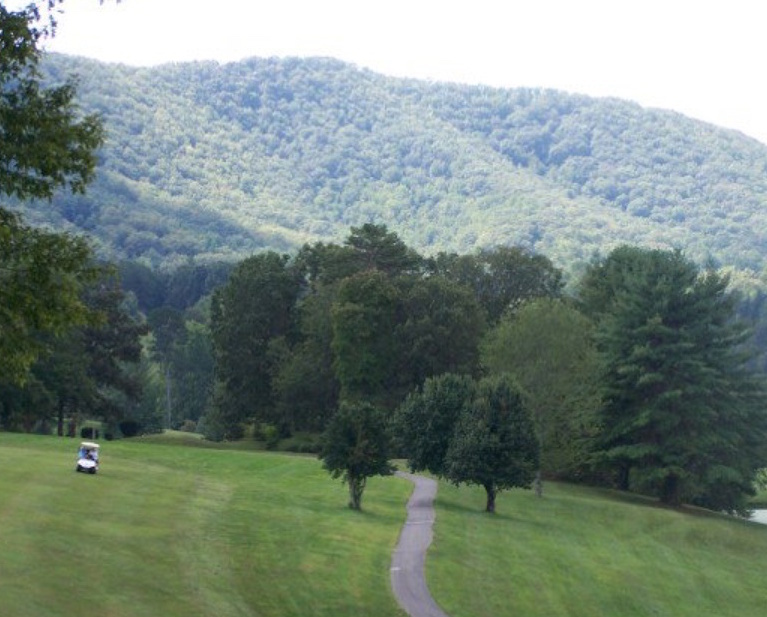 Next, head to nearby Blairsville, Georgia for a spin around the Butternut Creek Course at the Butternut Creek Golf Course. The Union County Recreation Department operates this historic course, which will challenge your water hazard escape skills on 13 of the 18 holes. After your round concludes, visit The View Grill for a tasty meal while you soak up views of the spectacular North Georgia mountains. Finally, hop over the state line to Tennessee, just 16 miles from downtown Murphy. If you’re short on time, try the 9-hole Copper Basin Course at the historic Copper Basin Golf Club. Take in some impressive scenery while you try to outsmart those crafty golf course developers. Of course, every golfer deserves a visit to the candy store, also known as The Club Shoppe on Highway 64 west of Murphy, NC. Besides stocking up on the latest “must have” golf accessories, you can order a set of custom-fitted golf clubs that match your golfing goals and swing habits. And who knows – your new irons and putters might really kick-start your game. If your hiking boots and walking stick are itching for a good day hike, our region is chock full of great hiking destinations. In fact, you’ll find some beautiful wooded trails right here in Cherokee County – and one in the Murphy, NC town limits. In fact, let’s start there – after fortifying yourself with an incredible cup of liquid energy, otherwise known as coffee, and pastries at The Daily Grind. Next, stroll over to the Murphy River Walk, with a trailhead right behind the historic L&N Depot. While you trek along two miles of shaded walking trails, enjoy the marshy wetlands, hardwood forests, and meadows. You’ll see plenty of native plants, and you might encounter some birds and small mammals. You’ll also get up-close-and-personal with the Hiwassee and Valley Rivers, which just so happen to converge right in front of you on the trail. This walk is especially refreshing on a hot summer day. Maybe you’re up for a more adventurous hike, with lots of elevation changes and a surprise around every bend. Check out the Nantahala National Forest, criss-crossed with so many trails we’ve lost count. In fact, this forest is so large that it’s divided into three regions: the Cheoah, Nantahala, and Tusquitee Ranger Districts. Regardless of your destination, you’ll see tons of native plants, some unique to this part of the world. You might even encounter some roaring waterfalls, especially if we’ve had a few rounds of rain. If the legendary Appalachian Trail is on your bucket list, the Nantahala National Forest contains a great AT day-hike destination: Wayah Bald near Franklin, North Carolina. If you’d prefer the easy route, enjoy a pleasant one-mile round trip from Forest Service Road 69. For a more energetic hike to Wayah Bald, take the Winding Stair Gap route, with lots of high-elevation climbing along well-graded trails. You’ll also pass several springs and campsites. Either way, you’ll end up at the historic stone fire tower, built in 1937 by the Civilian Conservation Corps. 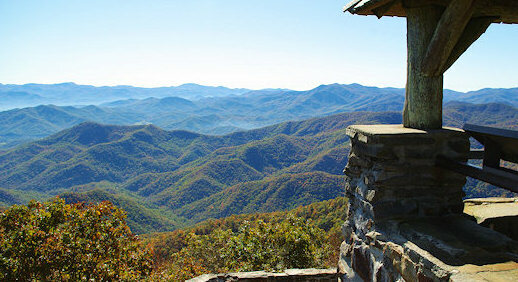 On a clear day, you might see North Carolina, Georgia, South Carolina, and Tennessee – all at once. Bring the camera! Or, maybe you’d like to take a moderate-to-difficult day hike along the beautiful Fires Creek Rim Trail, which rings the Fires Creek Wildlife Management Area. Starting near Hayesville, North Carolina, the entire Rim Trail encompasses 25 miles, but you can choose a manageable chunk that provides some spectacular ridge-top views. Fires Creek has several trails to choose from, the Rim Trail just happens to be a favorite. Besides viewing lots of native plants and birds, you could encounter deer, Russian boars, or bears – so be on your best behavior. Of course, this snapshot barely scratches the surface of day-hike possibilities. For more detailed information, contact the United States Forest Service Station in Murphy, NC at 828-837-5152. For maps and hiking gear, visit the outdoors-savvy staff at Appalachian Outfitters on Tennessee Street in downtown Murphy. And who knows – we might see you on the trail! If you’re the first person in the neighborhood to try an offbeat new sport, gear yourself up for some slacklining here in Murphy, NC. What is slacklining? Well, imagine a cross between tightrope walking and skateboarding. Basically, you balance on a flat piece of nylon webbing stretched between two trees or poles. You’re generally several inches to a few feet off the ground – not suspended above Niagara Falls. Slacklining might sound like some extreme sports fad, but it has been around since the 1980s. As slacklining mythology goes, mountain climbers were itching for something to do during rest periods, so they decided to test their balance by stretching climbing ropes between two trees. Now, devoted slackers nationwide are performing their own personal balancing acts. Some are even doing yoga and gymnastics while they’re perched above the ground. Speaking of happy slackers, you’ll be pleased to learn that slacklining has attracted fans of all ages and abilities. In other words, you don’t have to be a super-fit circus tightrope walker to enjoy this inexpensive sport. You also don’t need any fancy gear – just comfortable clothes that don’t constrict your movements. Some slackers wear nicely broken-in flat-soled shoes, such as tennis shoes; while others work the slackline with their bare feet. If you choose this route, make sure the surrounding ground is free from glass or other sharp objects. To be on the safe side, clear a 10-foot space on every side of the line. So let’s say slacklining sounds like your kind of sport, and you’re chomping at the bit to get started. Join up with the Murphy Slackers, like-minded folks (including families) who have established a slacklining presence in Konaheeta Park, just across from the Hiwassee Valley Pool and Wellness Center. Walk behind the last baseball field, near the end of the Murphy Riverwalk. Throughout the summer and early fall, the Murphy Slackline Park is full of action. During Murphy Slackers’ regular gatherings, you’ll see several slackers working the lines while others mingle nearby. By frequently checking the group’s Facebook page, you might learn about a potluck picnic, giving you a great meal while you meet some devoted slackers. Chances are, they’ll also find excuses for cozy get-togethers during the winter (indoors, of course). 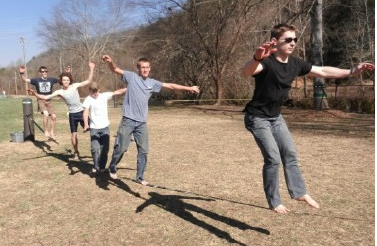 Come spring, the Murphy, NC Slackline Park will gear up for another season of activities. Get ready to join those happy slackers! Maybe you’re coming to Murphy, NC for a short vacation, and you’d like to stay somewhere more comfortable than a sterile hotel room. Maybe you’re building your dream home, and you need somewhere to live until it’s move-in ready. Or, maybe your company has transferred you here, and you haven’t had time to buy your ideal mountain home yet. Fortunately, a nicely furnished rental cabin will meet your needs. You’ll also get a real feel for our special corner of the Appalachian Mountains. Dream about your cabin’s warm wood interior and comfortable couches and chairs – maybe even some rustic. Each morning, stroll on the deck with your coffee, and enjoy the gorgeous view. You might even see some deer or wild turkeys walking up the driveway. It just doesn’t get any better! Let’s face it: you’re hooked on our beautiful mountains just like we are. You want to find that knock-your-socks-off rental cabin right now. That’s a smart move, as a nicely furnished cabin represents an excellent value, compared to a similarly priced hotel room. After all, your cabin provides all the comforts of home. Besides bedroom furniture, you’ll have a living room and dining area – furnished down to the lamps and knick-knacks. You won’t have to eat with plastic plates and utensils, because your kitchen cabinets will contain dishes and silverware. So how do you find your dream rental cabin? Well, finding a needle in a haystack would probably be easier than locating it yourself. Cherokee County has hundreds of hills and hollows, and houses are often tucked back into the woods. Also, privately owned rental cabins won’t have “For Rent” signs plastered on them. Rather than wasting time on a wild goose chase, contact the folks at Mountain Country Cabin Rentals. Visit their website, and view rental cabin photos before contacting MCCR for details. When you call, specify the dates of your stay, plus your preferred number of bedrooms and other amenities. Also, remember that some rental cabin owners have their places up for sale. If that’s the case, a potential buyer might want to see the home while you’re staying there. Get the details on that arrangement before finalizing your rental. After you get the rental agreement in place, start making your packing list and counting down the days. You’ll get the keys to that Murphy, NC cabin sooner than you think! While you’re here, you may want to purchase your own cabin in the mountains. That won’t be a problem! 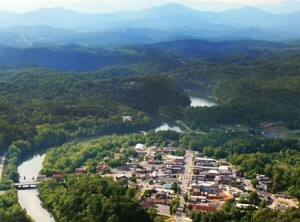 See all the properties for sale in Murphy NC and contact us or call to let us know what we can do to help. We’re here for you! If escaping to the mountains has been on your bucket list, and you’ve finally cleared your calendar for the weekend, program your GPS for beautiful Cherokee County, North Carolina. Specifically, plan a trip to Murphy, NC, where you can experience peace and quiet, small-town charm, and drop-dead-gorgeous vistas everywhere you look. 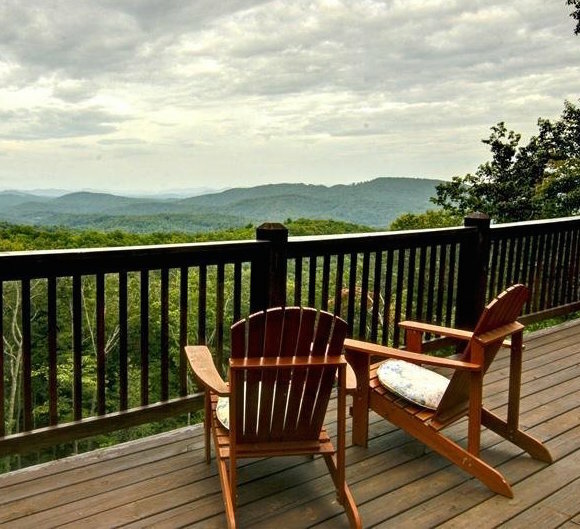 Next, reserve that secluded cabin where you can ogle the wildlife and marvel at the stars while you relax on the deck. 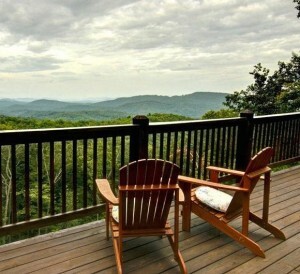 Contact the folks at Mountain Country Cabin Rentals to find that perfect getaway spot. To get the most from your Murphy weekend, plan to check in on Friday afternoon (or if you’re really lucky, Thursday afternoon so you have an extra day!). After you arrive, take time to soak up the solitude and put yourself into slow-motion mode, or “mountain time” as we call it. Next, head into town for a glass of wine and Happy Hour entertainment at The Daily Grind in downtown Murphy. For dinner, Murphy’s Chophouse and Shoebootie’s are always good bets. Back at the cabin, settle down for a good night’s sleep, with your weekend still stretching ahead. On Saturday morning, wake up with visions of a hearty breakfast dancing in your head. Make that dream a reality with a weekend breakfast buffet at Brother’s Restaurant, or fill up on the delectable pancakes at Blue Mountain Grill. After that, walk off your meal by browsing the downtown Murphy shops. You’ll find antiques and collectibles, art galleries, handcrafted baked goods and olive oils, and even a well-stocked outfitters store…plus much more. If you’re in the mood for lunch, the Red Brick Deli serves up hearty overstuffed sandwiches. Or, take a spin through Foster’s and Decker’s Flea Markets, a few miles west of town at the Route 129 intersection. These almost-legendary establishments feature everything from handcrafted wood furniture to antique farm implements…and everything in between. If you find yourself with some extra time, head west into Tennessee’s stunning Ocoee Gorge, the site of the 1996 Olympics whitewater competitions. It’s well worth the short drive, and you’ll love the jaw-dropping scenery. Now that you’ve worked up an appetite for dinner, head over to Doyle’s Cedar Hill Restaurant for a delectable meal using many local ingredients. In fact, Doyle’s frequently hosts “Farm to Table” dinners featuring local farmers’ and growers’ bounty. After savoring your meal, stroll over to the Tiki Bar for some rousing live entertainment. After a good night’s sleep, enjoy some R&R time on the deck, and then head off for another satisfying breakfast. Next, take a leisurely day to enjoy the mountain scenery. Ride through the Nantahala National Forest, which really is the “Land of the Noonday Sun.” Or, visit Hiwassee Dam and Fields of the Wood, both reachable via Route 294 west of Murphy. If you have some extra time, continue through Tellico Plains, Tennessee and return to Murphy, NC the long way. You’ll find that while you’re here, there’s no shortage of Things to do in Murphy NC so long as you enjoy the great outdoors, small town atmosphere, and enjoy a little exploring. Sometime on Sunday, you’ll turn the car toward home and leave your weekend paradise. Of course, if you’ve been captivated by the mountains’ charm, you might consider living here. As luck would have it, we can help with that, too. 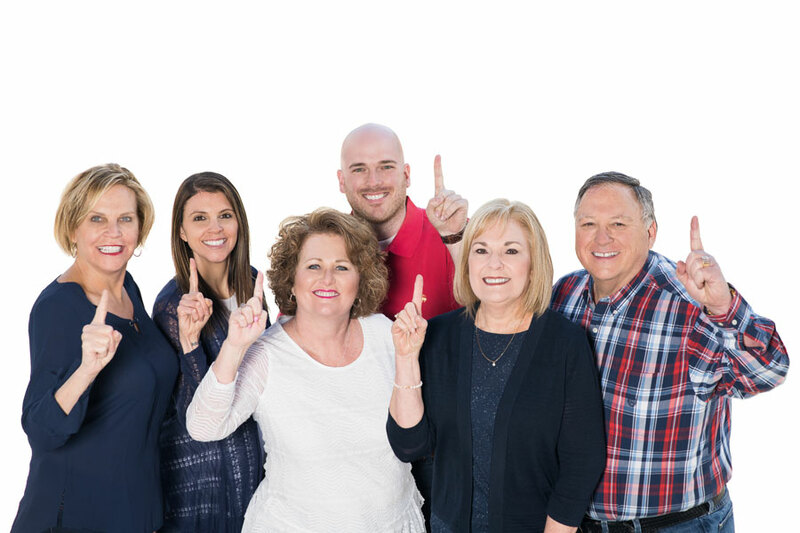 You can search all the real estate for sale in Murphy NC right from our website and let us know what we can do to help 🙂 I will warn you – the more weekends you spend, the harder it gets each time to leave.